We have just returned from the most beautiful funeral. A little girl, aged just five. Heart-wrenching. The daughter of friends who battled the Cancer Troll for their Princess Kezia for nearly two years. Kezia's parents battled in prayer, and many battled with them. When conventional medicine had done all it could do, they tried nutritional Therapy. It seemed to be working, the prayer and the oranges. The Troll seemed to be losing its grip. Beautiful Kezi regained her health and defied expectations. Then just before Christmas it all went downhill fast. Last Thursday she finally slipped away. "Just like in the Enid Blyton book, The Enchanted Wood, Kezi has climbed to the top of the Faraway Tree and through the hole in the clouds to ForeverLand. The land has moved on... but one day it will be our turn to follow her up into Foreverland and we'll be with her again..." her mother said, her words reducing me to tears yet again. Can anything be more devastating than losing a child? Her parents spoke of their memories, those extra 18 months they've had with healthy Kezi, which doctors said wasn't possible. The story didn't turn out the way her parents had hoped. She didn't find complete healing here in this world... and yet they still have Hope. Their faith has carried them. My tears fell constantly as I listened and watched and witnessed the beautiful way this family said goodbye to their precious daughter. The way their faith has held them, comforted them even though they have questions, and are indescribably sad and lost without their eldest Princess. Kezi died just three months shy of her sixth birthday. She had planned a Garden Party to celebrate reaching that milestone. 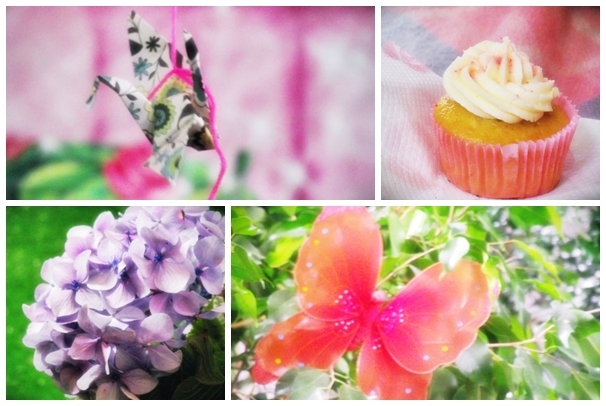 In honour of her dream, Kezi's amazing parents decided to create that Garden Party for after the service, to say a beautiful goodbye, celebrate her life, her beauty and the things she loved. Children were invited; girls and ladies asked to come dressed in pink. 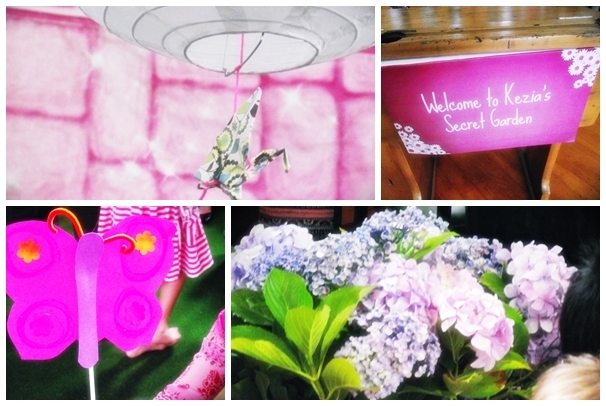 Astro-turf and topiaries, balloons and butterflies filled the room; sugared cupcakes and a Princess bouncy castle helped turn a dusty church hall into Kezia's Secret Garden, while Kezi's favourite movie, 12 Dancing Princesses, was projected on a wall. It was the most un-funeral-like funeral I have ever been to. Also the most moving, the most beautiful, and the most incredibly appropriate. Why farewell a child with sombre black? Say goodbye with bubbles and twirling skirts. Wipe your tears as "Shine" echoes through the hall. See her friends playing in honour of her, full of life. Feel that tug in your heart that says, "Remember how fragile life is." How precious our children. How fleeting our lives. Treasure every moment. Hug them and love them while we can. And thank Jesus, who Kezia loved and trusted, that she is now safe in Foreverland, twirling and dancing with angels, healed and whole. Those who carry her in their hearts will miss her, and weep many tears. But they are not hopeless tears. There is comfort. And hope. We will see her again, that I know. *tears* Beautiful and oh so sad at the same time. So grateful for the hope they will see her again oneday. clicked the link to Kezia's Honey, what a heart-breaking journey but what a lovely way to celebrate and farewell Kezia. So sad for someone so young to be taken but what a beautiful send-off. So sad, I don't even know how to comment on this... such a beautiful and brave send-off for their wee darling. I can physically feel my chest tighten at the thought of losing a child, yet their faith and hope is admirable, and necessary. Definitely makes me want to hold my wee guys closer with the fact that life is so precious and fragile. thank God for faith...because it is only through faith that we find HOPE. oh my I am crying my eyes out. she was the same age as my girlies. I cant even imagine... my heart breaks for her family. What a beautiful send off, just so very very perfect. oh I'm crying here. It is so impacting that they had such courage and hope to throw her such a celebration of a send off. So appropriate as you said. May we all celebrate our children's lives in such a way every day they are with us.